Extra space for your messages! Blog > Extra space for your messages! Over the years, we’ve heard from many postcrossers on how they wished they could write a bit more on their postcards. Some people are able to use very thin pens and make their handwriting extra small… but often this is not enough for the more talkative members with plenty of stories to share. Communication should be encouraged as it is at the heart of Postcrossing, so in order to give these wordy members an outlet for their creativity, Postcrossing is henceforth changing its format from postcards to letters!. Aren’t letters great? Plenty of space for the local news, the weather report, a lengthy update on affairs of the heart, or this month’s writing prompt on your favourite breakfast! It feels good to expand beyond the constraints of the normal 10×15cm rectangle and just write to our heart’s content. Any message that fits on a postcard will also fit inside a letter anyway, so don’t let the extra space intimidate you — you can write as much or as little as you’d like, or even include a drawing to help you fill out the space. Let’s put all that delightful writing paper to work — it’s time to write, write, write! Does that mean we can't send out postcards? Oh wait. Is it April Fools Joke? Is this for real, or is this meant as April fool's? Noooo - I enjoy Postcrossing BECAUSE I don't have to write a long letter! and I love the variety of pictures I receive on the cards. Tell me this is an April Fool's day prank ? You very nearly had me there! Good one! It is April Fools right... I even zoomed the picture. I am glad that everyone is so sharp today. I must admit I was startled. What a great April fool's!!!!! If it is one, I prefer postcards that what postcrossing is all about, isn't it. If this is for real, now I'm retired I don't have time to write long letters! So I will stick to postcards. Does this mean we will not send postcards any more? OH NOOOO! I had been waiting for an April Fools joke all morning but didn't expect to find it here :). I hate to write letters, I hope this is an April joke, isn't it ? Are you kidding?? I really hope this is an April Fools post. Well I think it must be an April Fool Joke. I love writing on a postcard, you dont get bored reading the little amount of news on a card, it does not take hours to write a card, and isn't Postcrossing about sending and receiving postcards? Please dont change it! I hope this is an April Fool's joke! I love the images on the post cards, and I'd be so sad if it changed. Thank heavens it's April 1 !!! Hahahahaha, that’s a good one! You got me! I was ready to quit, must have been a weak moment. Haha! I am so glad to see I'm not the only one who got upset when first reading this post! PLEASE be an April Fools joke... I love sending and getting postcards!!! You almost got me there! I went from panic to laughter in a split second. Happy April Fools! You almost convinced me. But then I remembered! The meaning of a postcard is to show s.o. a pic, quote, cartoon or anything else and not to tell my life. 1st is the frontside. Nice try guys, I was thinking of what to write and nearly was through my first para ! I'm calling April Fool's on this one! I sure hope that this is an April Fool's prank. I like Postcrosser the way that it is! Honestly, I had forgotten about today being April Fool's Day because it is Easter. I read about it in the German Postcrossing Group on Facebook. And yes, sometimes it would be great to have more space available, but in this cases, one can use an envelope and write on the complete postcard. But this April's Fools joke is quite boring, I've read better ones today. Happy Easter, btw. Hmmm. Brings me to the question, is every country here aware of April Fool's Day? Not much of a 'thing' here in the Bahamas. Happy Easter though. I thought Postcrossing is having another "sister", a Lettercrossing?!! Sure hope this is an April Fools joke! I LOVE seeing the pictures from other countries. I like postcards, therefore I joined postcrossing. It`s an April Fool, isn`t it!? I hope everyone took a look at the calendar. It is very good April fool, isn´t it??? Hi meiadeleite, I love your humor in post-crossing! Happy Easter. Totally got me! Good thing I looked at the comments! As someone who has large handwriting and a hard time making it small, this made me excited for a moment until I caught on. Like any other day I would be really mad, except today. April Fools !!! Good one! But I will never give up my postcards!! This project has been one of the best things I have ever done! I have received a couple of letters since I joined, and have loved them. But postcards are the best!! LOL! 😂 I enjoy writing and receiving both letters and postcards! 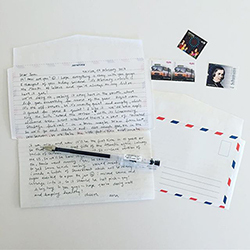 And if you'd like to be randomly matched with a letter penpal, we recommend checking out the Letter Writers Alliance or (for the girls), the International Geek Girls Penpal Club. They're both excellent! Well done meiadeleite. It was so convincing! The only April Fool joke I saw this year and it was a really funny one. Thanks! Funny! I find that sometimes I DO want to write more, so I send my postcard then follow up with a card or note - maybe with some photos. Two for one!! I would not prefer letters instead of postcards. Postcards are easy to be written and we don't have to write much. If we write letters I don't know what kind of space we should occupy. What a great April Fool Joke! Thanks for the smile!! Good one! But I like the current setup as it is. It is all about the postcard with opportunity for letters from time to time. Some folks request the postcard in an envelope. Then it's "letter time"! I was quite upset when I quickly popped in yesterday and saw the blog post...so much so, that I logged off instantly and didn't read any of the responses because if I had, it might have helped me remember April Fool's day...that was a good joke...on me!. You got me! But I had decided I was gonna still send postcards. Ha! So many April Fools! I didn't even turn my computer on that day, too busy getting my stuff organised for an Easter market on the 2nd so I guess I dodged this one. However, if people want to write letters longer than what fits on a postcard I certainly would welcome it. One of my favourites was an envelope from a lovely young lady in Russia who not only sent me two postcards but a four-page letter too. And for those who actually ask (or have no preference) to receive their postcard in an envelope I quite often slip in something extra; stamps, maybe a letter or a used bus ticket or something. The beauty of letters is that they can be as long or as short as the writer wants. ...Technically what we write on postcards are letters afterall. Just...really short ones! I did not fall for it :-) But it was a real good one! You had me there - naughty! LOL! I was thinking if I had to write a letter, I'd only be doing one every six months. I'm glad to know it was an April Fool's joke. For all those disappointed that they are not able to write long letters :-)... read postcrossers profile thoroughly. Some enjoy letters...especially if they fear for the safety of a postcard sent without an envelope. But i already started to copy out the Vienna Phone Directory of 1995 for mighty mouse of Trinidad ! I initially thought, "Wait a minute...isn't the whole point of Postcrossing to write and send postcards, not letters?" Then I read others' comments, which verified that I was reading an April Fool's news update. I enjoyed reading it hahaha. Looking forward to next year's April Fools news update! Yesterday I saw an A4 sized postcard - for those who really want to write much. Though it is an April fools idea. But we can have both postcard and a letter and tuck them inside an envelop. Should work well and will also save our postcards from getting spoiled in transit.